Fans of Bachelor in Paradise are on pins and needles now that Monday nights are going to get saucier! The wait seems too long, but that’s why we’re here. If you want to know every little detail on one of the fan favorites, then you came to the right place. Here’s a piece on Kristina Schulman, the desired contestant by all. One of the contestants who will be eyed by everyone is Kristina Schulman. She is the Russian dental hygienist from The Bachelor season 21, who could not win Nick Viall’s heart, and is now back on the band wagon in BiP to try her luck! Will she be seen with Dean Unglert? Find out everything you need to know about her in our Kristina Schulman wiki. Kristina Schulman was born on November 16, 1992, in Russia, and raised in Lexington, Kentucky. Her biological parents gave her up when she was small; as a result, she was in an orphanage until she was adopted at the age of 12. Schulman was pushing back tears while she explained how her biological mother would just disappear for long periods of time, and how she would have nothing to eat for days. In her bio on ABC, when asked who she would like to be for a day, Schulman answered her biological mother, because she wants to know what her mother went through, and if drinking was more important than her kids. Kristina Schulman was adopted from Russia along with three other children and has since been in the U.S., so she says she does not remember much of the Russian language. Schulman says she is very grateful to her adoptive parents who gave her a life that she could never have had otherwise. 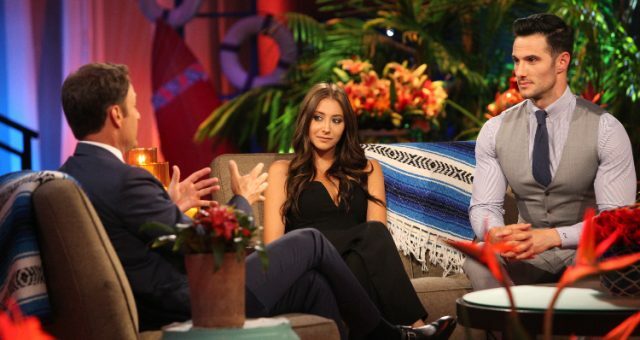 The 24-year-old was dumped in a very surprising elimination round by Nick Viall, but Kristina Schulman is back on Bachelor in Paradise season 4, looking better than ever! It’s no wonder Schulman’s smile is a million dollar one; she is a dental hygienist after all! Before coming to Bachelor Nation, Kristina Schulman graduated from the University of Kentucky, Lexington, in Anaesthetics, Dental Hygiene, Dental Surgery, and Epidemiology. She is a sweet and peace-loving woman and has come on the show with a goal to find true love. It’s obvious why she is a fan favorite and is loved by all for her charm! Melrose Ave gave me my wings ???? Kristina and Dean: Is it Just Puppy Love? Rumors of Kristina and The Bachelorette cutie, Dean Unglert being an item is already making rounds. The thing is, they were speculated to be dating (or at least crushing on each) other since The Bachelorette when he was trying to win Rachel Lindsay’s heart. So, it’s pretty obvious that they will be expected to be seen together in the next season of BiP. But will it go as far as the fans are wanting it to? Schulman has proven time and again that she is somewhat attracted to Unglert, and they both seem to have a lot in common, as well. The difficult backgrounds that they both grew up in is one of their major connecting factors and a sliver of hope for their fans to see them together. But there are rumors of a third angle added to the relationship, and this is where Danielle Lombard walks in. Reality Steve was quick to speculate on this love triangle. According to the website, Schulman asks Unglert on a date at the very beginning, but then the production halted for some reason. Once the show began filming again, Lombard enters, and it’s been super confusing ever since. Only watching the hit TV show will reveal the truth. Don’t forget to watch Bachelor in Paradise on ABC at 8:00 pm EST every Monday.